Emerald Village Newsagency has just released a new price regime on all its inkjet and toner cartridges. Fantastic savings are now available. Compare our prices and save. Click here to view the complete range. 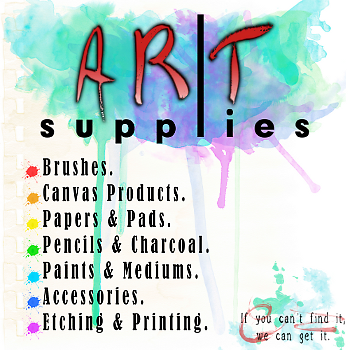 Within our Art Department youll find a great range of artist supplies including: brushes, canvas products, papers & pads, pencils & charcoals, paints & mediums, accessories and etching & printing. Call in and browse through our range of artist supplies, if you need any assistance we will be pleased to help, just ask our friendly staff in store. If you cant find it, we can get it! Included in our range of art supplies and school stationery products is a large variety of Derwent products. Click here to view our range of Derwent products. myki Cards & Top ups for myki, Melbournes new public transport ticketing system, are now available at Emerald Village Newsagency. Click here for more information. A Westpac ATM is now available at Emerald Village Newsagency. Click here for more information. 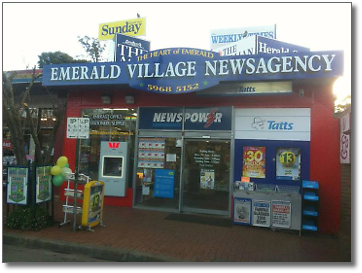 The NEW look Emerald Village Newsagency is now completed. A great modern appearance with a new presentation of all our cards, magazines, art materials, inks and stationery. Our aim is for our customers to enjoy their shopping experience, BUY LOCAL and receive best prices for our range of products. Local businesses and colleges are catered for with our "Business Accounts". We are truly the "Heart of Emerald". Its simple to arrange! Just click here to check out the title online and then make contact with us either online or drop into the shop. Ink cartridges. All brands and types. You wont get cheaper in Emerald or at that big place down town. Save petrol - buy local. Artists supplies - complete range now in store. Photocopying on state of the art equipment. Beautiful colour looks great. Latest hard back best seller books now on sale - a remarkable $9.95. Gift cards, including iTunes and major retail chains are now available.